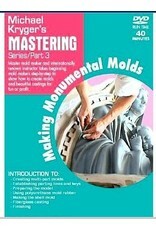 Join Michael Kyrger in Part 3 of his Mastering Mold Making and Casting series. 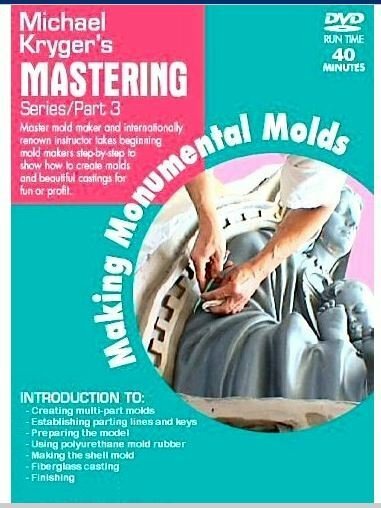 Michael narrates this advanced educational mold making and casting video on how to create monumental molds and castings. The molding and subsequent casting were done by two different industry professionals. Richard Bechtel, MFA, sculptor and mold making for over thirty years created the urethane mold and plaster shell. The gel coat and fiberglass lay up was accomplished by David Wolfe Designs. David is an industrial designer with over 30 years of industrial design and museum fabrication experience.In addition to the step by step instruction, you'll learn from the industry's best. The video lists the tools and materials for each phase of the work starting from finding parting lines to finished fiberglass casting. Even if you don't have a monumental piece to complete, you'll take away many tips and short cuts to add to your studio repertoire' from their over 50 years of combined mold making and casting experiences.Approx. 40-minute run time.